At least 200 people wearing camouflage and masks stormed the local administration building in the city of Kharkov, eastern Ukraine, local media said. The perpetrators are alleged to be members of the radical Azov battalion. 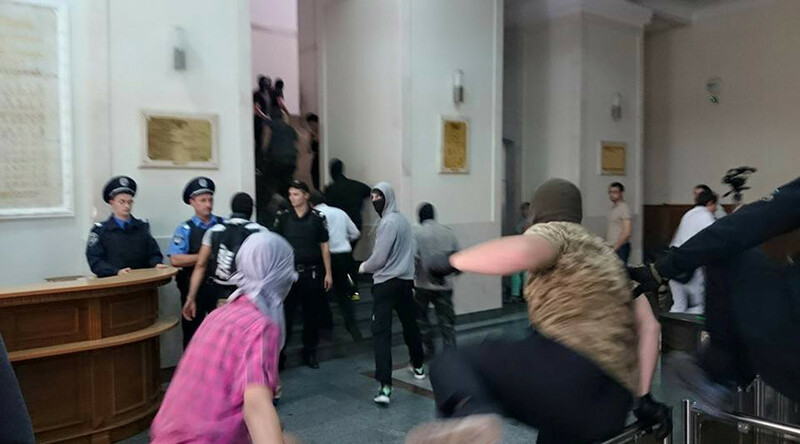 The masked men reportedly clashed with police and security forces at the city’s administration building. Those who have entered the building have also reportedly used tear gas, the Ukrainian 112 channel is saying. The masked activists were seen holding flags with the insignia of the radical Azov Battalion, which is accused of committing numerous human rights violations in Eastern Ukraine, according to international watchdogs. “There have been several small clashes between police and people in balaclavas. A few minutes ago somebody let off tear gas. The entrance to the city council is surrounded by a tight police cordon,” a journalist at the scene, from the 112 channel reported. Earlier, at least 50 people wearing camouflage and balaclavas had taken part in a protest in front of the residence of the local politician, Mikhail Dobkin, who represents the ‘Opposition Bloc’ political party, which wants to find a peaceful solution to the current crisis in Ukraine. The masked men had not set out any demands. However, they were reported to have stated their aim was to “to throw Dobkin out of the city and not to let Kernes become Kharkov’s mayor,” according to the 112 channel. Gennady Kernes has been the mayor of Kharkov since March 2010. Before the coup in Ukraine, he had been a strong supporter of President Viktor Yanokovich. However, he subsequently switched sides and has backed the new Ukrainian government in order to keep his position. The Ukrainian press later reported that the group had left the building and had departed from the scene.